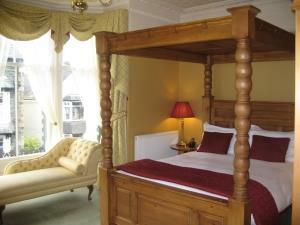 Stonegarth Guest House017687 72436work Guest HouseProbably the best B & B in Keswick! A house full of character, luxury, spacious rooms, excellent food and car parking. All set in peaceful surroundings and just 3 minutes' walk from the town centre. This historic building is a spacious and well maintained guest house. The tasteful decor throughout gives a real sense of peace and space, making this the ideal base for your stay. All the 6 bedrooms have fully modern en-suite facilities and are well-equipped with Sony TV, tea/coffee facilities, fridge, and direct dial telephones. One room has a king-size bed with a feature wall mounted headboard, whilst 3 deluxe rooms have traditional king-size 4-poster beds with chaise lounge. Our two premier rooms also have king-size 4-poster beds, you can relax and soak in a double spa bath whilst watching TV or use the separate drench shower with body jets.......perfect rooms for a romantic stay. Enjoy an excellent breakfast before exploring the fells or the local shops. Stonegarth has a guaranteed car parking space for each of room, a real bonus as on street parking is very difficult.